The Halifax Peninsula has seen plenty of multi-residential development in recent years, and there’s no sign of any slowdown in the sector. “Over the past 24 months, we’ve seen real growth in people moving back on to the peninsula, and they need places to live,” said Gordon Laing, the president and chief executive officer of Southwest Properties Limited, which builds, owns and manages residential, retail and commercial properties in Halifax. “There’s a lot going on in Halifax right now, and I think it’s starting to be on a lot of people’s radar across the country. I’ve lived here most of my life and we’ve never seen this number of cranes in the sky that are here now. The Halifax multi-residential market generally favours purpose-built rentals over condominiums, and many of the newer rental buildings are being delivered at or close to condo standards. There’s also been a shift in demographics of who’s filling apartments. Whereas they used to house mainly students and young professional singles and couples, there’s been a fairly substantial movement by empty nesters leaving single-family homes in favour of apartments. “That’s been great for us because those are people who tend to be at the higher end of the rental market,” said Laing. Baird Allen — whose firm provides landlords and tenants with property tax, valuation, counselling, planning, economic intelligence, space measurement and commercial brokerage advice — said these people don’t always live in their apartments 12 months a year. Many travel or have a winter rental in a warmer climate. The city’s development community has responded. The 21-storey, 300-suite Maple was the largest purpose-built rental building to be introduced to Halifax’s downtown core when it opened more than a year ago. The complex includes more than 14,000 square feet of retail space, indoor parking and 8,000 square feet of amenities. Among them are a social room with billiards area and full kitchen, fitness centre, indoor pool, hot tub, large terrace, and open space. Curve at South Park is a 16-storey downtown rental building with 198 units located across from Halifax Public Gardens and Citadel Hill. It includes: an entertainment area with a full kitchen, dining and lounge area and fireplace; a screening room with theatre seating; a fitness centre and yoga studio; a landscaped terrace with rooftop exterior swimming pool and hot tub; and an interior parkade featuring a car wash facility, bicycle stalls and a pet spa station. Curve is 25 per cent pre-leased and Laing expects to be at 50 per cent upon move-in, which is scheduled for March. He anticipates the building being fully leased within six to 12 months after opening. While Southwest converted its mixed-use Bishop’s Landing building from rental to condo after a few years of operation, Pavilion at South Park will be its first purpose-built condo. Seventy-six of its 84 units had sold as construction reached the sixth floor this summer, according to Laing. Pavilion shares underground parking and services with Curve, and also includes a 70,000-square-foot YMCA. It’s scheduled to open in September 2019. Southwest recently signed a 99-year land lease with Waterfront Development and must still go through the approval process for Cunard. The high-end 250-unit apartment building will also feature 30,000 square feet of retail, 20,000 square feet of office space and interior parking on a waterfront site between Bishop’s Landing and the Nova Scotia Power building. Laing hopes construction will start in late 2019 or early 2020. Southwest will move its offices into the building upon completion. “It will bring more people and more activity to the waterfront, which I think will be great,” said Laing. Southwest has a development agreement for Seton Ridge, a 63-acre site formerly owned by the Sisters of Charity and located two kilometres from the peninsula above Mount Saint Vincent University. It will be the company’s first foray into land development and will encompass about 180 single-family homes and townhouses, 2,400 rental and condo units, and retail elements over the course of a 10-year build. Excavation should begin next summer. Southwest also owns some downtown apartment buildings which are generating income, but could be redeveloped and intensified a few years down the road. “We’ve got our plate pretty full right now, but those are always nice to have on reserve,” said Laing. Several other companies are either building or planning purpose-built rental apartments and condos in Halifax. KIllam Apartment REIT’s (KMP-UN-T) The Alexander & Brewery Market is a mixed-use, 21-storey development at 5121 Bishop St. featuring rental suites and amenities including: a boardroom and common amenity room; a fitness room; a landscaped terrace and barbecue area; and underground parking for 228 cars, more than 100 bicycle stalls and a car wash bay. It opened this summer and suite leasing is ongoing. Killam has also proposed a multi-unit residential building at 1451 and 1435 Hollis St. called Governor’s Plaza. Westwood Group’s The Doyle is under construction and renting residential units at 5404 Doyle St., on the corner of Spring Garden Road and across from the new Halifax Public Library. The seven-storey, mixed-use building will feature ground and second-floor commercial space with residential suites on the upper floors, as well as a rooftop terrace and underground private and public parking. The same area is also the future home of BANC Group of Companies and WM Fares Group’s The Margaretta and The Mary Ann. The Margaretta will be a high-end, nine-storey rental building with one level of retail and 147 residential units. It will also have three levels of underground parking with additional tenant storage space. The Mary Ann will also have nine floors and feature a variety of unit sizes with amenities such as a fitness centre and underground parking. Monaghan Square is a 17-storey twin apartment development by Robert Margeson’s Young Street Equities Ltd., which was originally slated to be a condo. It’s under construction at 6100 Young St. in Halifax’s north end. 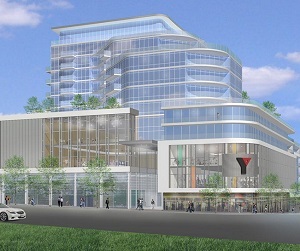 The property will feature a 33,000-square-foot landscaped podium deck with a barbecue area, a fitness room, a billiards room, an amenity room with a full kitchen, a boardroom, indoor parking and a residents-only car wash.
Starfish Properties is building The Roy, an upscale 22-storey condo at 1650 Granville St. It will feature: multi-purpose amenity rooms that include a kitchen and bar; an indoor pool with private cabanas; a gym; a yoga/meditation studio; men’s and women’s change rooms, showers and steam rooms, as well as a co-ed sauna; a theatre-style screening room; a landscaped terrace with an open fire pit, barbecue, seating and sun deck; a private boardroom; a guest suite; and a pet-grooming station. The first phase of Urban Capital’s Gorsebrook Park condo development is under construction after strong early interest from purchasers, while phase two has been released for sale. It will feature eight- and 10-storey buildings on Wellington Street in Halifax’s south end. A project proposed for a 2.4-acre former Department of National Defence site now owned by George and Joe Ramia has the support of regional council, but must still go through the approval process. Plans are for 335 condo units in 16- and 21-storey buildings along with a five-storey retail and office complex, a pedestrian plaza, and underground parking. 29th and State Streets Ltd. plans to build a mixed-use complex called Promenade at Robie South at the southeast corner of Robie and College Streets. The proposal comprises 20- and 26-storey residential towers with 376 units connected by a four-storey podium. It will include commercial space, public spaces, a promenade-style walkway, a fitness centre and parking.